Chachi ki dukan at Lanka was famous for the old lady who was fondly called Chachi (aunty). 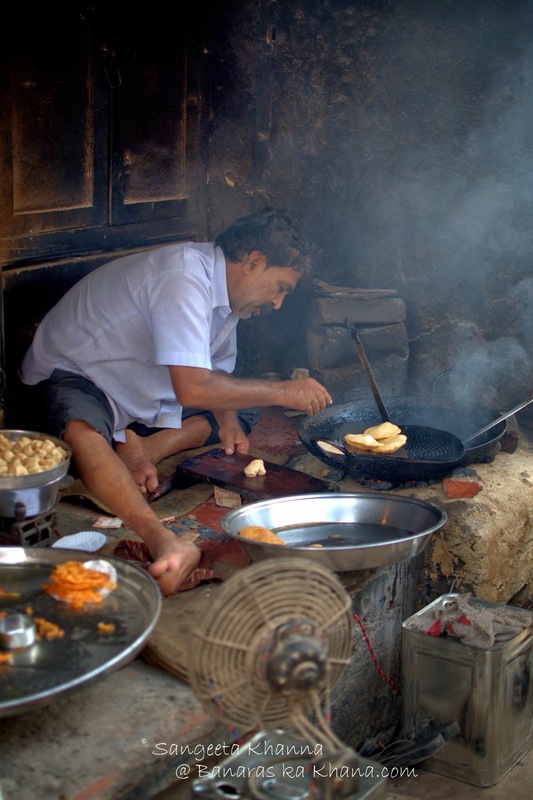 The shop was all about a small team of Chachi, mostly her family members who would churn out subzi and crisp kachoris on one side and hot crisp, syrup dripping jalebis on the other side of a small cramped shop. More of a hole in the wall actually. Let me explain where exactly this shop is located. Lanka is the 'mall road' equivalent, situated in front of the BHU (Banaras Hindu University) gate and you would find all sorts of fancy restaurants, roadside stalls of samosa, chai, pao bhaji, burger, pakodas and bookshops or student utility shops all in one place. The end of this road branches into three roads leading to Saamne ghaat, Nagwa and Sankatmoachan temple road. When you walk towards Sankatmochan road you see twin shops of kachori and jalebi right at the start of the road. The one that has more people waiting is Chachi's I conclude. The husband confirms as he has grown up in BHU campus. Another famous shop for kachoris in the morning is Pehelwan ki lassi shop that sells kachori subzi and jalebi in the morning and lassi and lavanglata throughout the day. This shop is located at the start of the road to Nagwa, to your right when you are coming from the university. We enjoyed this banarasi nashta when we were in Banaras last time. Just wanted to have a taste of this famous kachori subzi aur jalebi made in front of my eyes. And there I was braving the smoke and burnt smell of refined oil, waiting for my kachoris. It was well worth it I would say. For the experience and for the taste as well, just the taste of burnt refined oil kills it for me. I am sure it was fried in dalda (hydrogenated vegetable oil) a couple of decade ago and in desi ghee before that. But ghee is history now for this shop at least. We have had ghee fired kachoris in other places and it makes a marked difference in taste and aroma. Totally smoked walls, a rickety old table fan that blows air into the giant coal fired oven and a couple of men working in rhythm with a practiced ease. 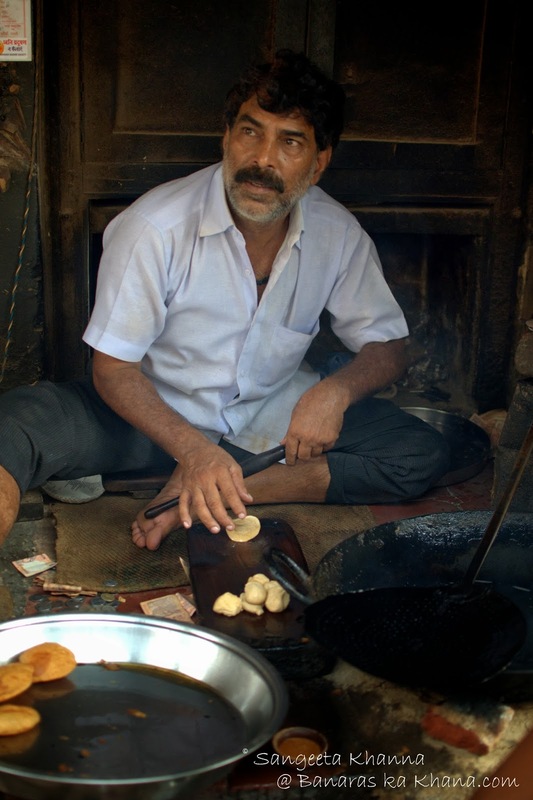 This guy was found rolling out kachoris fast, as if in tandem with the load of kachoris frying in the huge kadhai. 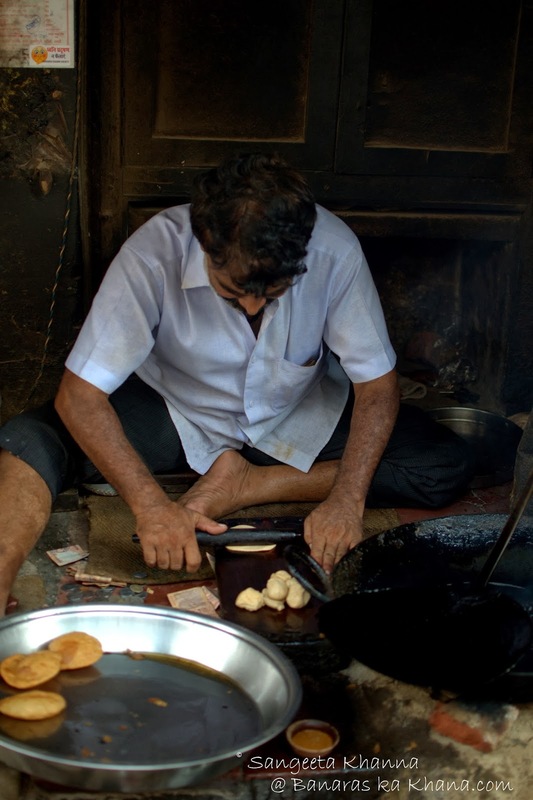 He quickly pinches off dough balls and arranges them on a wooden board, and then starts rolling kachoris fervently. He keeps dunking all the rolled kachoris into the huge kadhai with hot oil and another guy keeps frying the kachoris and arranging them all on a huge sieve. And once the kachoris become a little colder, they are dunked again in the hot oil to fry them once again. This is the secret behind super crisp kachoris that break into pieces once punctured. 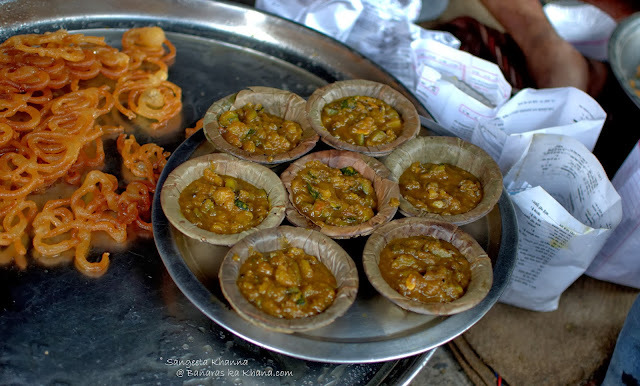 They ladle out heaps of kaddu ki subzi in dried leaf donas (disposable leaf bowls) and then arrange the kachoris on paper plates and hand out to the waiting people. Those white paper bags have jalebis in them, someone got them packed to take home. And believe me there are always a dozen people waiting for these hot kachoris and kaddu ki subzi. 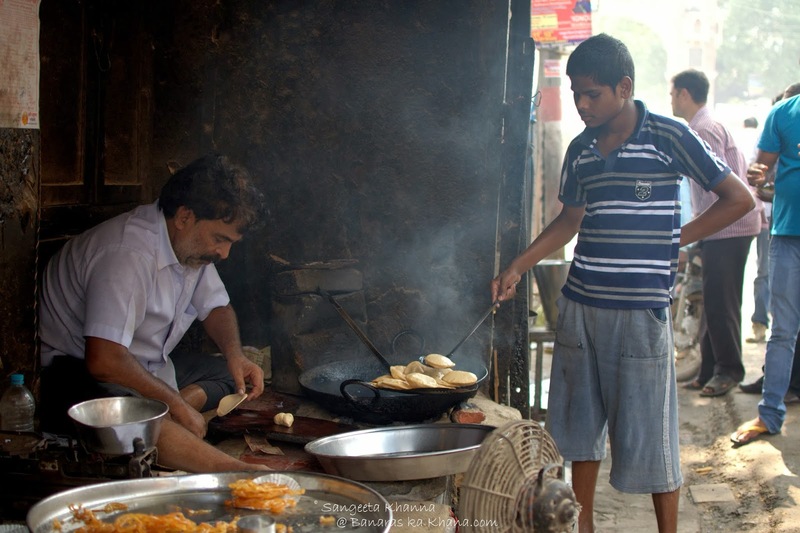 I loved the subzi, the kachoris from such shops was never a favorite, but I can eat a couple of them. Hot and crisp and all that jazz. Killer looks they certainly have. 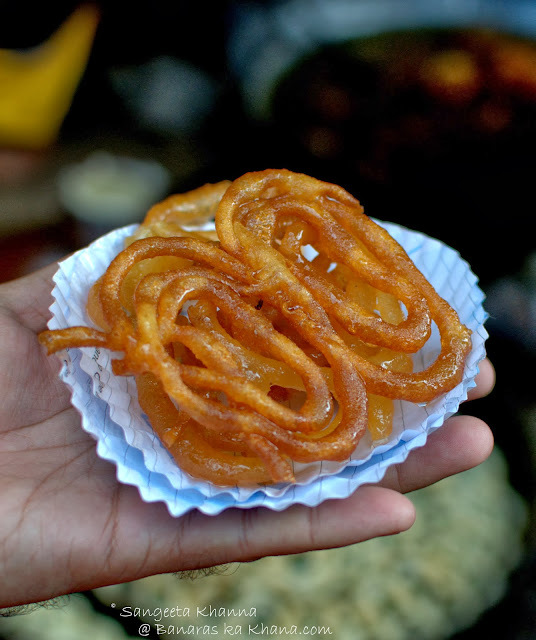 Did you see the jalebis too? 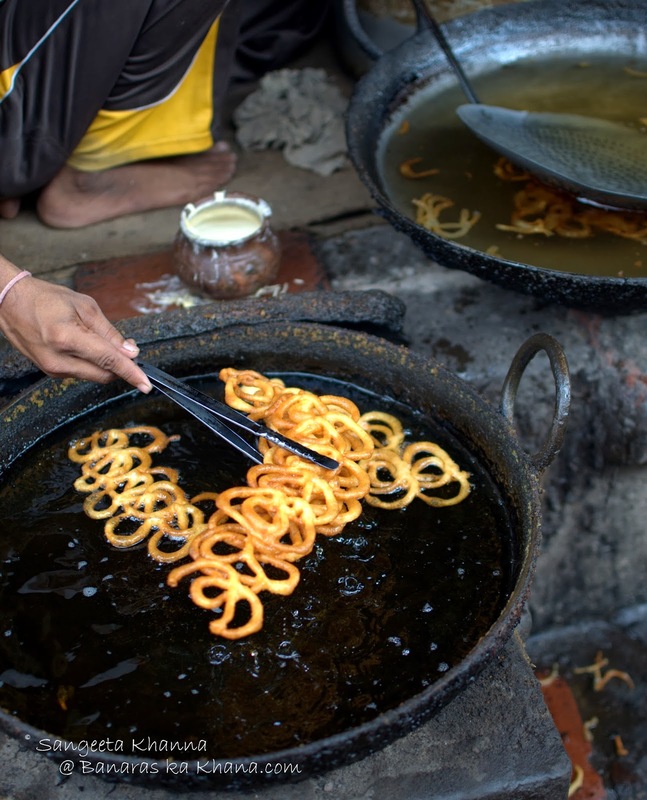 Spirals of jalebi were also being churned out on the other side of this hole in the wall shop. 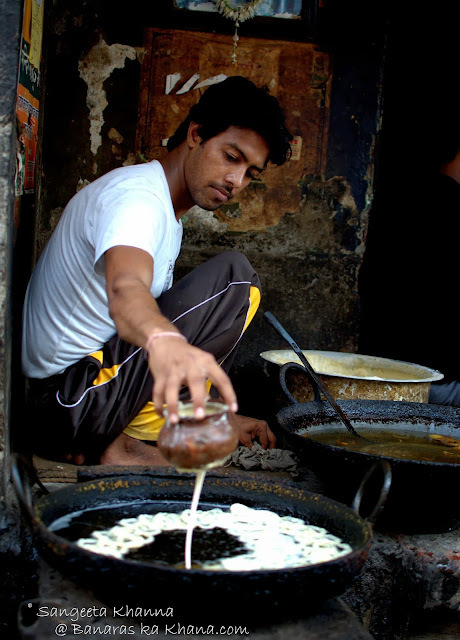 A thick slurry like fermented batter of maida with a hint of besan added is filled in an earthen pot and the batter is dropped in a constant stream in hot oil. Making circular patterns while it flows out. I love this part of making jalebis and was missing doing it myself. Been long time since I made jalebis. The spirals are fried both sides till they turn golden. Being turned and picked up with the help of tongs. And then being dunked into a thick sugar syrup. 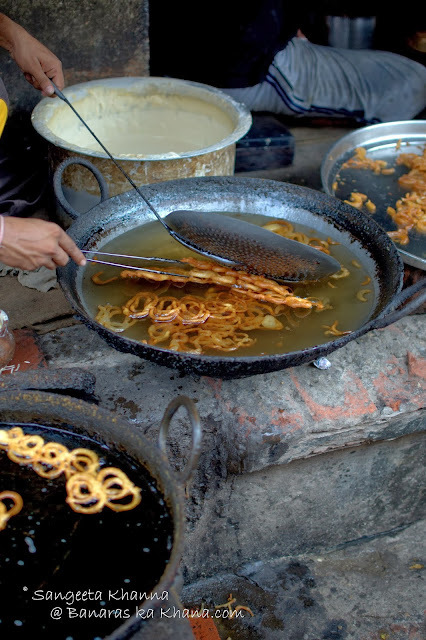 To be quickly weighed down with the help of that huge sieve, so the jalebis soak up the syrup instantly. After a couple of minutes in the syrup and the juicy crisp jalebis are sieved out from the syrup, the sieves doubles up as the display shelf. The jalebis fly off the 'shelf' quickly as people are already waiting to get their hands of garam garam jalebis (hot jalebis). 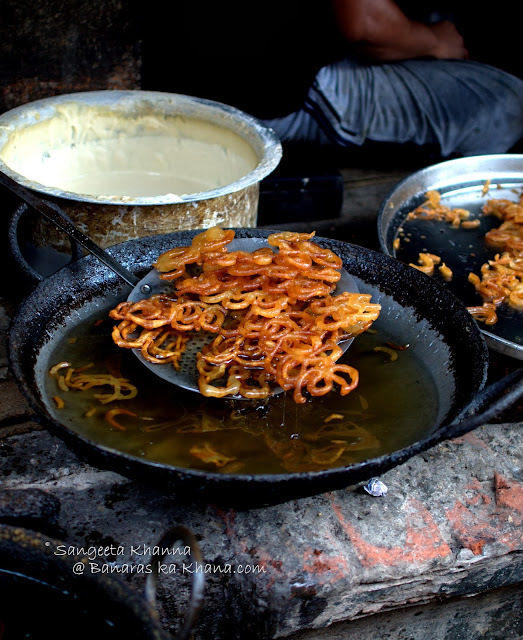 Here it is, one portion of the jalebi for the dessert part of the banarasi nashta. Quite a calorie high, inflammatory fats high breakfast it is. Interestingly, I had never seen this chachi as I would never pass that road in the wee hours when banarasi nashta was being devoured standing in a meditative trans facing this little shop by Chachi. Chachi is no more but I have heard stories about how people would ask her questions to tease her about bad kachoris or a soggy jalebi and she would shower them with choicest abuses in local dialect. It was more of a good breakfast with entertainment thrown in for good measure, as I have heard people saying. The entertainment came to us in the form of curiosity some people had in our camera. You see we had a good time enjoying this nashta and then walked towards Sankatmochan temple to work out the damage. I loved the experience of watching it through your eyes. Though the burnt oil makes me nauseous too. But, I guess to try it once ought to be fine. Can you believe it that I have never been to Benaras in my life? 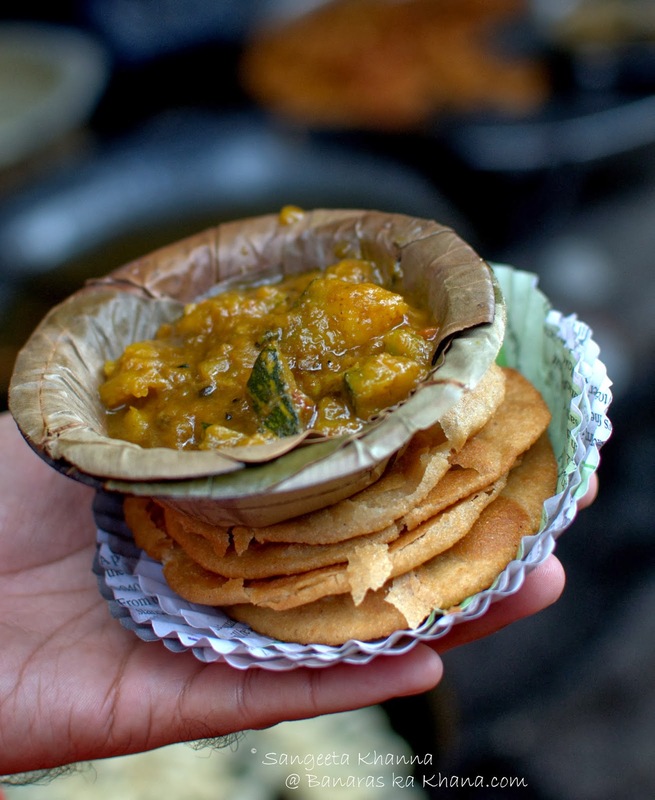 You made me remember one of the things I miss from my home town the most...;) kachori sabji. Though very oilu I cannot eat more than 2 or may be 4 but absolute delight it is! Great stuff! Have linked to your blog from my Varanasi Magic facebook page. Hi i am a pure banarasi. you did not found chachi because she passed away few years back. we actually go to that shop not only for cahori and jalebi also for the sweet abuse of chachi she was a very funny lady. pls aap ye wali sabji ki recipy bataeye.. The pumpkin subzi recipe on this blog is quite close to this but I will try and post this exact recipe.